Bangladesh team are high on confidence as they have chased a huge total of 215 runs in the 3rd T20. Can they continue their victory against Men in Blue? 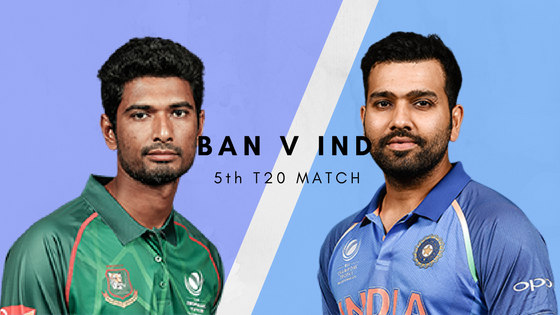 In Today Dream11 Fantasy Cricket Prediction| IND V BAN 5th T20 will try to find what are the chances of Bangladeshi winning the match? We will provide our readers the best dream11 team, recent and past performance of the players, likely playing 11, pitch report, who will win the match and what astrology has to say about the toss. Who Will Win The 5th T20, IND vs BAN? Match: India and Bangladesh in Sri Lanka T20 Tri-series,2018, IND v BAN, 5th T20. Average first inning score is 157. The batsmen are loving the pitch as the pitch is supporting the batsmen. It is expected that it will be a batting-friendly pitch. Expect a huge total in the 5th match. Seamers may get some help initially as rain is expected. India is way ahead in the last 5 matches played against each other. Men in Blue won 5 out off 5 matches. Bangladeshi won the last match against Lankan chasing a huge total and they are high on confidence. On the other side, India is continuing their winning streak without their main players. The weather at Colombo will make cricket fans unhappy as it is predicted that there are scattered thunderstorms at the time of the play. It is expected that there will rain and it may disturb the game. The temperature is expected to be 28-degree Celsius. Shikhar Dhawan, Rohit Sharma (c), Lokesh Rahul, Suresh Raina, Manish Pandey, Rishabh Pant, Dinesh Karthik (wk), Jaydev Unadkat, Washington Sundar, Shardul Thakur,Mohammed Siraj, Yuzvendra Chahal, Deepak Hooda, Vijay Shankar, Axar Patel. Mahmudullah (c), Tamim Iqbal, Mehidy Hasan, Mushfiqur Rahim (wk), Sabbir Rahman, Soumya Sarkar, Liton Das, Abu Hider Rony, Taskin Ahmed, Nazmul Islam, Imrul Kayes, Ariful Haque, Rubel Hossain, Mustafizur Rahman, Nurul Hasan, Abu Jayed. Rohit Sharma’s form is the main concern for the Indian team but he can destroy any team on a given team. India may try their bench strength but not at the cost of losing the match, so expect that Indians will play with the same team. Shikhar Dhawan, Lokesh Rahul, Rohit Sharma (c), Dinesh Karthik (wk), Manish Pandey, Washington Sundar, Vijay Shankar/Deepak Hooda, Suresh Raina, Shardul Thakur, Yuzvendra Chahal, Jaydev Unadkat. Bangladesh may think of Sabbir Rahman and Taskin Ahmed as they are not performing but they may play with the same playing 11 as they want to continue with the winning combination. Tamim Iqbal, Liton Das, Mushfiqur Rahim (wk), Sabbir Rahman, Nazmul Islam, Rubel Hossain, Soumya Sarkar, Abu Jayed/Ariful Haque, Mehidy Hasan,Mustafizur Rahman, Mahmudullah (c). Mushfiqur Rahim: Rahman Scored 72 runs off 35 balls with a strike rate of almost 206 and contributed 52.5 fantasy points. 70.52% of the dream11 fantasy users have selected him in their team. Dinesh Karthik: Karthik scored 39 runs off 25 balls with a strike rate of 156 and contributed 28 points. 29.49% of the users have taken him in their fantasy teams. Pro Tips: Try to keep Mushfiqur on your team as he bats at 4th down and he has more balls to play. If you are playing with multiple teams make a combination from the above list. Shikhar Dhawan: He has been consistent throughout the series but in the last match played against SL, he could not perform. He just managed to score 8 runs and got out early. He has contributed 6.5 points. For the 5th T20, 70.6% of the users have taken him in their team. Rohit Sharma: Indian skipper has been struggling throughout the series. He has scored 11 runs and contributed 13 points. 17 is the highest run he has scored in Nidahas trophy. 46.37% of the users have selected him. Suresh Raina: Raina has scored 27 runs off 15 balls and contributed 22.5 points in the last game. 67.74% of the fantasy users have chosen him. KL Rahul: Although Rahul played his first match in this tournament, he could not utilize the opportunity as he just scored 18 runs and contributed 15.5 points. 27.34% of the users have selected him. Tamim Iqbal: Tamim scored 47 runs off 29 balls and contributed 29.5 points. 59.95% of the users have selected him in their team. Liton Das: Liton Dashas scored 43 runs off 19 balls and contributed 29.5 points. He opened for Bangladesh team and proved the decision right. 63.03% of the users have selected him. Soumya Sarkar: Sarkar just scored 24 runs off 22 balls and contributed 16 points. 36.16% of the fantasy users have taken him in their dream11 team. Pro Tips: As there is a huge chance of rain so try to keep top order batsmen in your team. For multiple teams try to make a combination from the above list. Mahmudullah: He scored 20 runs off 11 balls and took 2 wickets and contributed 33.5 points. 63.95% of the users have selected him in their playing 11. Washington Sundar: Sundar is playing as a lead bowler for Men in Blue in the absence of main bowlers. He took 2 wickets in his 4 overs and contributed 23 dream11 points. 76.65% of the users have selected him in their team. Pro Tips: Try to keep both of the players in your team as they contribute in almost every game. Shardul Thakur: Thakur was given Man of the Match in the last match played against Lankans. He took 4 wickets in his 4 overs and contributed 46 points. 69.18% of the fantasy players have taken him in their team. Jaydev Unadkat: Unadkat was expensive in his last inning. He just took 1 wicket in his 3 overs and contributed 14 points. 61.52% of the users have selected him. Yuzvendra Chahal: Chahal took 1 wicket in his 4 overs and contributed 16 points. 50.59% of the users have selected him. Rubel Hossain: Hossain failed to take a wicket in the last game. 36.59% of the users have taken him. Mustafizur Rahman: Rahman took 3 wickets in his 4 overs and contributed 29 points. 68.85% of the users have selected him. Pro Tips: You can any bowlers in your team from the above list. Pro Tip: Keep Rohit Sharma as a Captain in grand League as very few users have selected him and there’s a chance that he will perform tomorrow as reported by our astrology team. Our astrology team has predicted that India will win the match if the game happens and according to our cricket experts, Men in Blue will easily win the match. Astrology expert of crix11 says that Bangladesh will win the toss and they will decide to bowl first. They will love to chase as they have chased a huge total in the last game. Conclusion: If you are reading till the end that means you are series for your team and you want to win every match. If you make a team from the above post your winning chance will almost increase to 100%. We try to make sure that we provide you all the details. This is it for Today Dream11 Fantasy Cricket Prediction| IND V BAN 5th T20. GOODBYE! It has helped me to win and learn a lot.. Thanks for your Support Atul, very soon we will update the detailed prediction of all the matches.